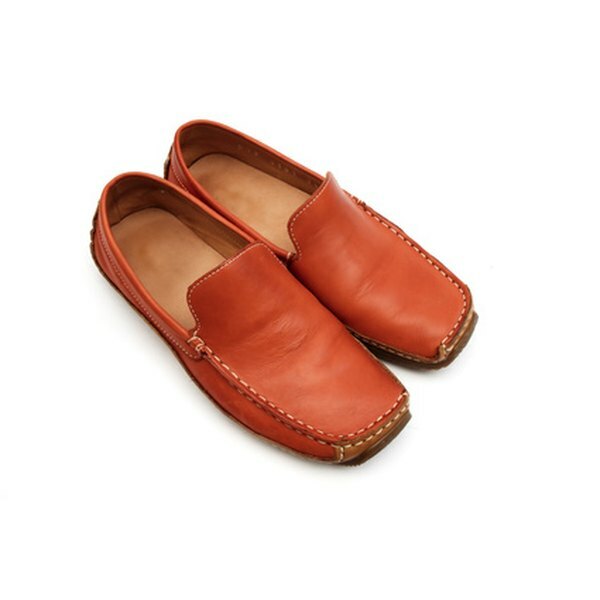 Leather shoes can be repaired from home for a low price. Nothing spoils the sheik look of a pair of leather shoes like a nasty gouge. The good news is that most areas on leather shoes can repaired and restored, leaving any sign of damage virtually erased. Most professional leather repair services do an outstanding job at this, but the fee is often close to the price of a new pair of shoes. Instead, you can opt to pick up a few simple products, and do the job yourself for a fraction of the cost. Thoroughly clean the area around the damage with an alcohol swab. Allow the area to dry before continuing. Examine the gouge, and determine the shortest distance between any two edges of the gouge. Apply a small amount of garment glue to the inside of the damage, and pinch the area closed. Hold it manually until the glue has set. Apply the liquid leather repair with a cloth, and rub it in a circular motion over the gouge. Continue adding the substance until all of the small cracks have been filled, and the original damage is covered. Allow the shoes to dry again. Use the alcohol pads again to smooth the repaired surface. Wipe away any areas that appear over-treated or heavily contrasted to the original leather. If you wipe away too much, allow the shoes to dry, and repeat step 3. Wipe down the shoes with the leather conditioner. Use a different cloth than you used for the liquid leather, and scrub the entirety of the shoes with a circular motion to blend in the repair job. The moisture will also help the leather stretch and adapt to its repaired state, so use the conditioner liberally. How do I Repair a Swimming Pool Deck?